Karina Petersen | Office of Senator Murkowski Sep 7, 2018. WASHINGTON D.C.— U.S. Senator Lisa Murkowski (R-AK) participated in a Commerce, Justice, and Science (CJS) Appropriations Subcommittee hearing yesterday, to review the President’s Fiscal Year 2019 (FY19) funding request for the Bureau of Industry and Security, the International Trade Administration, and the United States International Trade Commission. 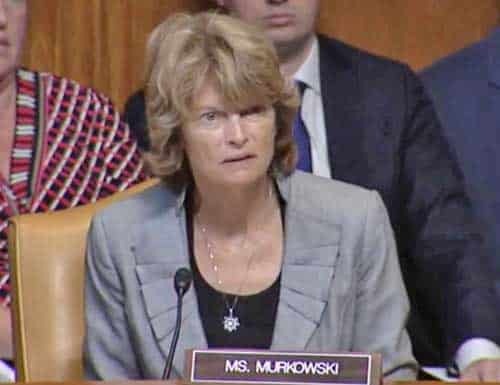 During the hearing, Senator Murkowski expressed some of the concerns of Alaskan stakeholders regarding the seafood industry. “If I may just quickly say, with the administration and USTR, they’re working on the China trade strategy, but we’ve always had the open channel to present good ideas to them. Which is why the Secretary has always encouraged that. And so I’m always happy to hear from industries and develop a strategy that works for them and then present it to the administration,” said Nikakhtar.